I got the idea for this from Fleur's channel (video here). I loved the idea of this and considering most of my make up is drugstore this would be fab to try and do. I have tried not to use any of there Top 10 to create a big of variety! I actually found it really really hard to whittle some of these products down. I've tried to use products for every kinda face part as well (if that makes sense...) so let's take a peek! A cult classic really, or it's turned into one anyway. I really love this foundation. It's a medium weight foundation that has fantastic coverage and is really long lasting. For me as well it doesn't clash with my oily skin which is always going to get a thumbs up in my book. A gorgeous cream blush, incredibly easy and quick to apply. Small packaging so perfect for travelling, yet lasts for a while. Again, really good quality and very long lasting and I love the colour of this. It looks really natural on and as it doesn't go powdery on application it's great for lips as well. Essie polishes are normally £7.99 from Boots, so these mini collections are a great way to nab three of the current collection and work out at around £3.34 each - so not bad at all! Yes they are mini, so not as much product, but they still have the same Essie quality and the ones I have so far are fab. A bronzer I've had for about a year now and still not touched the pan. It's a gorgeous subtle matte bronze that's perfect for us paler types, but helps to warm up the complexion and is a dab hand for contouring as well. Great price and it smells like chocolate. They know how to market to us girlies! Probably one of the best quality high street lipsticks I've ever tried. Really pigments, great coverge and good longevity and a wide range of colours. I love these and I'm always reaching for them. A really good price and something I think is quite overlooked in drugstores - needs much more hype then it currently has! A really fab drugstore version that I've been reaching for continually. It's calming on the skin and amazing at removing make up. It's a very watery version compared to Bioderma, but it's such a good price for the quality of product that you get. I've fallen head over heels for it. I love these crayons. So so easy to use and apply and really long lasting as well. Great product for such a small price, and a fab dupe for the Clinique Chubby Sticks. Not a huge range of colours, but I love the champagne and bronze colours - great for everyday wear. My ultimate favourite shower cream/gel/wash ever. It's amazing as a shaving cream - it keeps the legs moisturised instead of dry and flaky and is actually just amazing on the skin. Pricey for a shower product, but definitely worth it for me as I really struggling after shaving. My perfect eyeliner. It's got the easy to use felt tip applicator and fantastic pigmentation. It's really easy to apply over eye shadow and doesn't transfer onto the top of the lid, and is really long lasting. A great price as well for a liquid liner. A new addition to my routine but one I absolutely love. They are so comfortable on the lips and also protect really well against the sun. I love the subtly of the colours as they are perfect for everyday wear at work as well and they are just altogether fab to me. I have literally rewritten this so many times. I did notice that there isn't a lot of skincare on this... Unfortunately I tend to go for the higher end bits for skin care - make up however I have found you can get some amazing bits for a low price. I'm sure I've forgotten something... O well, here is my top 10! 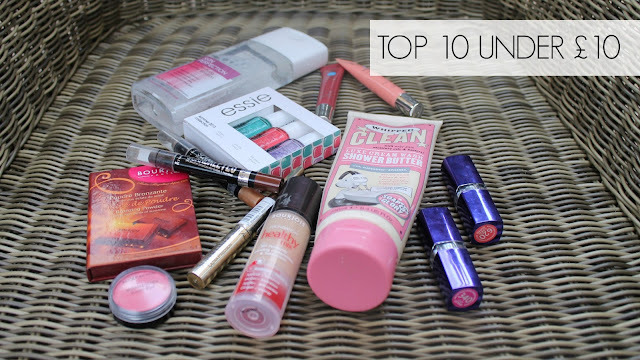 What's your top 10 under £10? Ooh lovely choices, I have that Max Factor blush and love it! I want the Essie trio!